Gómez, M. C.; Gómez-Soberón, J.M. ; Gómez, L.; Santillán, O. Experimental testing has been used, in different researches, to define reduction factors of physical and mechanical properties in recycled concrete, depending on the quantity of recycled material used to produce new concrete. These reduction factors were applied to design different five-storey buildings having recycled aggregates percentages in the RC of 0%, 15%, 30%, 60% and 100%. These structures, subjected to seismic load from an accelerogram database, were analysed elastically and designed according to the Mexico City Seismic Code. Models with different amount of recycled aggregates were compared with models with conventional concrete to evaluate the dimensional variation of columns and girders, the required longitudinal reinforcing steel, the maximum displacements and the moments and shear forces in elements. Results show that using recycled aggregates in percentages from 15% to 100%, produces increases, compared with conventional concrete buildings, in the structural elements dimensions (in percentages from 5% to 45%), reinforcing steel (20% to 60%), and the general response of the structure, in percentages of up to 14%. Gómez, M. [et al.]. Design and elastic behaviour influence of recycled RC buildings subjected to earthquakes. A: World Conference on Earthquake Engineering. 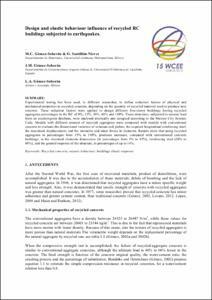 "Proceedings of the Fifteenth World Conference on Earthquake Engineering, Portugal, 2012". Lisboa: 2012, p. 1-10.